Magewell’s Pro Convert hardware converters let users reliably bring traditional video signals into live, IP-based production infrastructures using NewTek’s NDI® technology. These self-contained NDI encoders transform HDMI or SDI input sources into full-bandwidth NDI streams with extremely low latency and are truly plug-and-play, with automatic input signal format detection and DHCP-based network configuration eliminating the need for manual setup. Two 4K and two HD models provide a flexible choice of encoding resolution and input interface. The Pro Convert HDMI 4K Plus transforms sources up to 4K Ultra HD at full 60 frames per second via an HDMI 2.0 interface, while the Pro Convert SDI 4K Plus converts 6G-SDI signals up to 4Kp30. The Pro Convert SDI Plus and Pro Convert HDMI Plus encode sources into NDI streams up to 1080p60 HD; the latter can also accept a 4Kp60 HDMI input, down-converting it automatically to HD for encoding. The use of live, IP-based media transport has expanded from its roots in content distribution to become an integral part of many professional production workflows, giving customers massive flexibility while helping reduce deployment costs. NDI has been one of the key enabling technologies driving this transition. The ability to connect existing HDMI or SDI equipment investments into IP-based media networks is a key to making the new IP production paradigm affordable and practical for content creators. While some new products such as cameras support NDI directly, many customers want to use their current equipment with NDI-compatible production software. The Pro Convert family offers easy-to-use, cost-effective and reliable solutions to connect existing sources to NDI-enabled networks, systems and software. Source video is automatically converted at its native resolution and frame rate by default. For users wanting control of the conversion process, an intuitive browser-based interface provides access to status monitoring, advanced settings and FPGA-based video processing including up/down/cross-conversion, de-interlacing and image adjustments. 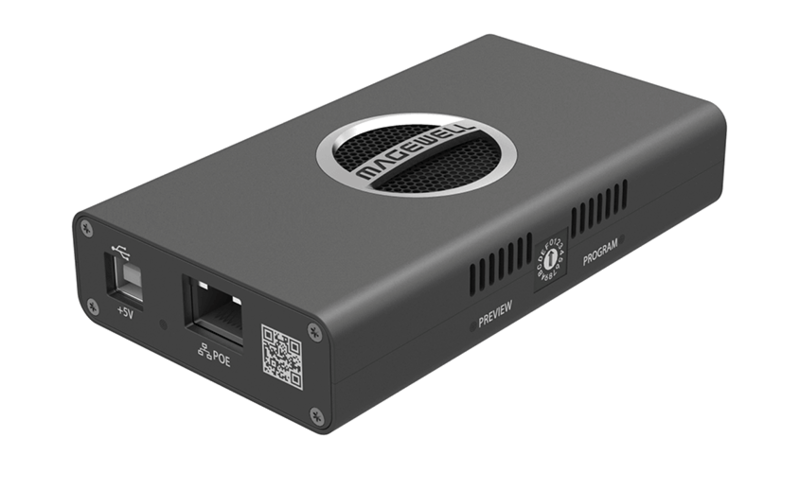 Power for the ultra-compact Pro Convert devices can be supplied via Power over Ethernet (PoE) or the included power adapter. Loop-through connectivity on Pro Convert “Plus” models allows the input signal to be sent simultaneously to additional displays or equipment without external splitters, enabling sources to be easily used in new IP workflows without disrupting existing video infrastructures. Value-added features for live production applications include a 1/4"-20 thread for standard camera-mounting accessories, preview and program tally lights, and NDI-based PTZ camera control. The Pro Convert family is distributed in North America and South America by Mobile Video Devices (MVD). This article is sponsored by Magewell.